Housing has returned to British politics. Falls in home ownership have driven it there, but in so doing opened up a much needed debate about a long neglected issue: renting. Too often in recent decades the background assumption of housing policy has been that social renting is a declining tenure, and private renting a temporary one. But the first of these is undesirable, and the second inaccurate – as we have eventually learnt a full 30 years on from the start of the decline in youth home ownership. While ownership rates have ticked up in the past year, the new normal of lower ownership is here to stay. Those on lower incomes, without family wealth to draw upon, are no longer the owners they might once have been. One-in-four new-borns’ first home is in the private rented sector today, compared to just one-in-thirteen in 1996. This is what social change looks like, with people bringing up children in homes they can be asked to leave with just a few months’ notice, while paying higher rents, often for lower quality, than social renters enjoy. That message has now made its way into Whitehall. Social renting has stepped centre-stage over the last couple of years, for reasons good – and tragic, in the case of Grenfell. Theresa May’s 2017 conference speech may have been overshadowed by a coughing fit but she did announce £2 billion for affordable homes, including genuine social rented properties. The extension of Right-to-Buy to housing associations has been long grassed, and Pay-to-Stay scrapped. The totemic Housing Revenue Account cap has been lifted, while Labour has plans to support councils and housing associations to build. In retrospect the hard opposition to social housing under David Cameron looks more like an aberration than continuation of a long term trend. But what should come next? For supporters of social housing like the Resolution Foundation part of that is easy – it’s time for real resources to match the rhetoric, for cash to match the words. We shouldn’t take it for granted that this will happen. New supporters of social housing like the Prime Minister have made progress by building back up the affordable homes budget after heavy cuts early in this decade. However, it’s noteworthy that the last two fiscal events commitments have taken the form of extended borrowing capacity (removing the HRA cap and the Affordable Homes Guarantee Scheme) rather than grant. Even if all the £2 billion announced by Theresa May went on genuinely social rented properties (which it won’t), only an additional 28,700 homes would result – less than 1 per cent of the current stock. Far greater investment is needed to make a real difference, and there are strong arguments for it. But many have a tendency to wish away tough choices on the financing of social housing. On the right that has meant years of praising the very real benefits of Right to Buy for some families, without recognising what such large discounts have meant for the social housing stock. On the left, it can involve arguing that we can simply switch spending today from expensive housing benefit payments for private rented properties to pay for building social rented homes. In reality we can’t do this without hitting low income families living standards. Of course there are important trade-offs between capital investment and the benefits bill, but they are about the very long term – a subject we’ll return to on Friday. The typical capital grant for a genuinely social rented property is in the region of £70,000 – while the annual housing benefit saving from a three-bed property in the social rather than private sector is closer to £3,000 a year. 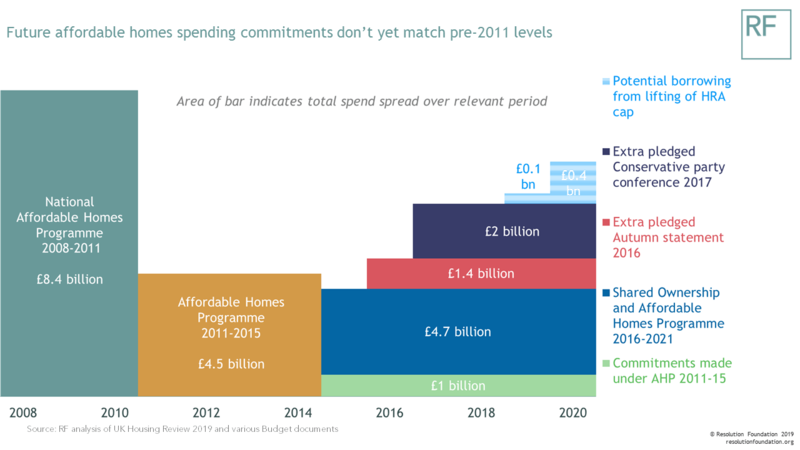 The 23 years it would take in housing benefit savings to recoup the capital outlay means it is part of a much broader case for long term investment – not the beginning and end of it. Politicians in charge of budgets confront today’s spending trade-offs. Supporters of social housing shouldn’t pretend there is a free lunch and instead make the case that capital spending on social housing is both relatively cheap and badly needed at present. Generating lasting consensus on building social homes also requires honesty that this is the work of decades. 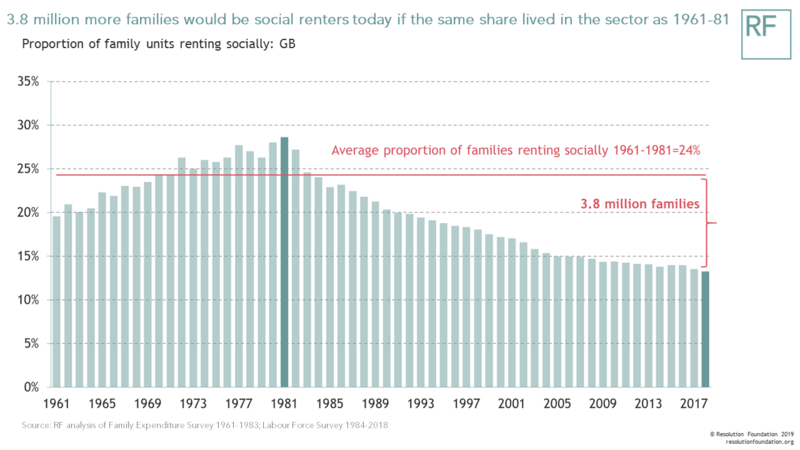 Just 13 per cent of families today live in social housing, but over 3.8 million more families would be social renters if the same proportion (24 per cent) had access to it as did on average between 1961 and 1981. We built around 13,000 new social rent homes a year in Great Britain over past five years. If we’d added ten times that amount, we would have only moved the dial from today’s 13 per cent to around 15 per cent. That doesn’t mean we shouldn’t build more social housing, it just means we need to do so year after year after year. And it should be underpinned by the view that social housing is part of the wider social inheritance we leave for future generations, particularly in an era of fast growing private wealth too often determining who Britain works for. Some opposition to social housing is rooted in prejudice. But some is based on valid concerns that should be engaged with, not ignored. Take for example the worries set out by Neil O’Brien, a thoughtful Conservative MP, about the employment rates of those in social housing relative to those renting privately. This is a fair question to ask – after all the raw gap is large. While 75 per cent of private renters are in employment, the figures are 53 and 55 per cent for those renting from a council or housing association respectively. Of course, much of the difference is driven by very different populations, with single parents and disabled people being much more likely to live in social housing. But there is much more work to be done on how much those differences explain the size of employment gaps, how those factors vary between neighbourhoods, and what can be done to tackle them. We will be making our own contribution to that much needed discussion on Wednesday. Arguing for more social housing is easy compared to prioritising where it should go. Here’s an example. Manchester and neighbouring Salford have a lot of social renting in the middle of Greater Manchester. Should the priority for more social housing in this city region be more social units in these areas, squeezing as much social housing as possible into every one of the many new blocks going up near the city region’s fastest jobs growth? Or is more social housing better placed in the leafy suburbs, towns and villages that currently have much less to offer by way of affordable accommodation for lower income families – like Trafford? Which you think is right depends on how you prioritise mixed communities, stable populations, travel to work times and many other factors. We certainly don’t have a definitive answer to the difficult but crucial question of where new social housing is best targeted, both between and within regions. Indeed there almost certainly isn’t a single one. But thinking through what the best answer might be for different places is very important and too often waved away. The social purpose of housing associations and councils are key. But that brings with it difficult trade-offs we often don’t discuss. Here’s just one. In the coming years it’s possible that rents will rise faster in the social than private rented sector in some areas, following government agreement to social rents rising by CPI plus one per cent from 2020. From the perspective of some current working tenants this is bad news. But from the perspective of future potential tenants it can be good news, allowing housing associations in particular to build more properties. Which is more important should be a hot topic of debate – with different answers in different places. The public support social housing. Four-in-ten of us think that more social rented homes are needed in our local area, more than any other tenure. There’s a renewed political focus on social housing too. This turnaround is welcome, but should not be taken for granted. The combination of very low borrowing costs with painfully high housing need is persuading politicians more than ever that social housing has an important part to play in solving our housing crisis. But those of us supporting a wider role for the social rented sector have thinking to do too – not just to win the argument about volumes, but to ensure a new era of social home building truly delivers for the lower income families that it exists to serve.